Bonus - Own a piece of St. Matthews History! St. Matthews Church has been a cornerstone of the West End for 117 years. This year it celebrates its 100th anniversary at its present site at the corner of St. Matthew's Avenue and Maryland Street. The church has reinvented itself a number of times in its history to remain a vital part of the community. It is currently being converted into the West End Commons, a 26 unit housing complex. Its current array of community services and a smaller St. Matthews chapel will remain part of the building. 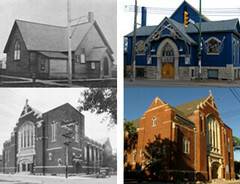 Here's a look back at 117 years of St. Matthews Church ! In 1896 Holy Trinity Church Anglican Church created two missions within the city of Winnipeg. St. Barnabas, located on Thistle Street, (part of present-day Portage Avenue East), included a soup kitchen and a 40-bed hostel. 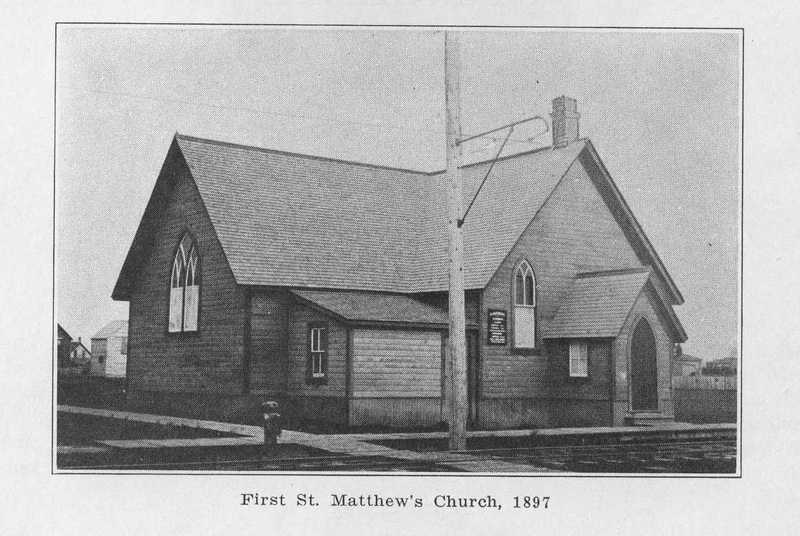 St. Matthews was a simpler affair, offering a Sunday School program on Mulligan Street, (now Sherbrook Street). Anglican Archdeacon Fortin said in 1897 that “These infant missions in time will grow into great centres of Christian work” - and they did. St. Barnabas became one of the city's largest hostels, the Winnipeg Lodging and Coffee House on Lombard Street, where Margaret Scott did much of her early work. St. Matthews Mission grew into St. Matthews Church which has occupied three sites in the West End and is now embarking on a new chapter as the West End Commons. St. Matthews Mission's first home was the house of Mr. and Mrs. Horace Buley at 448 Mulligan Street (now Sherbrooke Street) near Nellie Avenue (now Ellice Avenue). On Sunday afternoon there was a Sunday school and on Thursday evenings a church service. Little information can be found about the Buleys, other than he was a Justice of the Peace with an office in the 300 block of Main Street. Late that year they suffered a terrible tragedy when their 17 year-old son Horace Jr. died when he fell down an empty elevator shaft in the office building he worked at. The mission's Sunday school was first run by A. O. Cheney and W. W. Forest and soon boasted more than 40 students. In 1897 the Buleys donated a lot located a few doors north of their home at the corner of present-day Sherbrook Street and Ellice Avenue so that the mission could construct their first church. Opened on May 16, 1897, it was a simple wood frame structure that cost $1,200 to build and had a capacity of 350. In 1901 it was expanded to include a nave and basement. Between 1900 and 1906 the city extended sewer and water service to the West End. This touched off a population explosion as streets were subdivided into smaller urban lots for residential development and the first apartments blocks began to rise. This growth in population was echoed in the size of St. Matthews' congregation and Sunday school. In 1901 it was large enough that it cut ties with Holy Trinity and the mission became an independent congregation. An important figure in these early years in St. Matthews' history was R. B. McElheran. An accountant by trade, he was a member of Holy Trinity Church when St. Matthews Mission was first created and assisted in its organization. When W. O. Cheney left Winnipeg in 1898 to pursue theological studies at Wycliffe College in Toronto, McElheran took over the Sunday school program. In 1900 he, too, left Winnipeg to study at Wycliffe and returned in 1906 as an ordained minister. He took over from Rev. 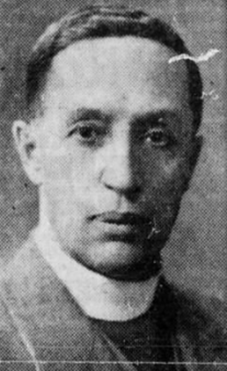 H. St. George Buttrum, St. Matthews' first pastor, who had resigned in 1905 due to ill health. McElheran would lead the church for the next 24 years. In 1907 the old wood church was bursting at the seams so the congregation bought three neighbouring lots for about $5,000 and began planning their new home. This new $20,000 church would be a modified Gothic design in red brick with stone trim and large enough to hold 600 worshipers. A large, full basement would become the home of the Sunday school program. The cornerstone was laid on October 17, 1908 and on January 10, 1909 the new St. Matthews Church opened with a special service. Soon after the new St. Matthews Church opened, it was again operating near capacity thanks especially to the Sunday school program which by 1912 had grown to more than 800 pupils, said to be the largest Anglican Sunday school in Western Canada. Committed to the West End, the congregation purchased a number of lots at the corner of Livinia Avenue (now St. Matthews Avenue) and Maryland Street on which to construct their next church. The cost of this new church would be subsidized by the sale of their old property to Elim Chapel. 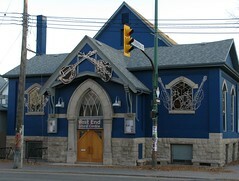 We now know that first church as the West End Cultural Centre. You could add that the first St. Matthew's church was designed by English architect Herbert Edward Mattews. He also designed the Minto Armoury (1914) and the Rothesay Apartments (1912) by St. James Park (now Vimy Ridge Memorial Park).